March 4, 2016 – Engineers at NASA’s Langley Research Center in Hampton, Virginia, are preparing for a series of water-impact tests to evaluate the Orion spacecraft and crew safety when they return from deep-space missions and touch down on Earth’s surface. After venturing thousands of miles beyond Earth, Orion will splash down in the Pacific Ocean off the coast of California. At Langley, engineers are preparing to mimic various mission finale scenarios this year by dropping a mockup of Orion, coupled with the heat shield from the spacecraft’s first flight, into Langley’s 20-foot-deep Hydro Impact Basin. NASA is building Orion to launch atop the world’s most powerful rocket, the Space Launch System (SLS), and carry astronauts to deep space destinations, including on the journey to Mars. Water-impact testing will help NASA evaluate how the spacecraft may behave when landing under its parachutes in different wind conditions and wave heights. Langley has already conducted dozens of splash tests with a less sophisticated capsule mockup, but this is the first time it will assess the higher fidelity Orion ground test article. 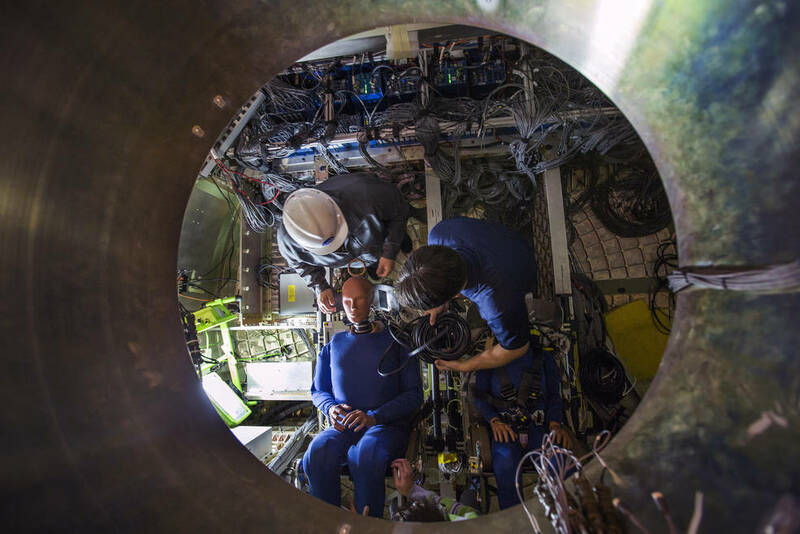 Two test dummies – one representing a 105-pound woman and the other a 220-pound man to assess the impact on different-sized people – have been installed in the crew seats of the Orion mockup. “These test dummies are the same type of test dummies that are used in the automotive industry for front collisions,” said Rick Ybarra, test engineer at NASA’s Johnson Space Flight Center. Each dummy was lifted and then manually installed into the interior of the capsule. Prior to installation, engineers placed tiny sensors inside the test dummies, which will be used to help NASA understand the loads the crew could experience when returning from deep space destinations. Within the next few weeks, engineers will apply a waterproof coat to the capsule and complete final sensor checks with a data acquisition system. The capsule itself is wired with sensors that allow engineers to collect data during the water-impact testing. Engineers will start the series of nine drop tests in early spring. During the first three tests, engineers will drop the capsule vertically at different angles into the basin. For those tests the dummies won’t be equipped with suits and helmets. After the third test, the dummies will be outfitted with spacesuits and helmets. After the four vertical tests are completed, the capsule will undergo a series of five swing tests. The dummies will remain in the seats fully suited for those. According to Carpenter, collecting data on the dummies with and without suits allows engineers to make comparisons, which will aid in the computer modeling of Orion’s splashdown. Water-impact testing is one of many steps required to ensure Orion will meet the demands of sending humans to deep space for the first time and in the future on the journey to Mars. During Orion’s next mission, Exploration Mission-1, the uncrewed spacecraft will launch atop the SLS, travel more than 40,000 miles beyond the moon and return at speeds up to 25,000 mph.